So, I’m a bit late on getting this out there, but ive been too busy singing Pharell’s “Happy” too much to care. But be that as it may, I definitely caught this week’s edition of WWE Legends House & it is exactly what I expected. Freaking hilarious. The show airs on the WWE Network each Thursday night at 8:00 p.m., & is immediately available on-demand after initial airing. It is truly what a fun, yet serious reality show should be – fast action, funny, but with a bit of a serious tone & not a bunch of petty crap going on ala the Real Housewives, Real Broke Wives, Real Wives Who Live Too Rich, or any other VH1 or Bravo reality show out there. All of the WWE Legends sitting around with Gary Busey talking about feelings & meditating during the premiere of “Legends House” on the WWE Network. So, they show all of the guys arriving & the main thing I realized early on is that Hillbilly Jim looks like an old gangster or like he would beat the crap out of someone who messed with his daughter or something. Hacksaw Jim Duggan & Tony Atlas have some kind of weird issue going on where you don’t know if they are going to like being in the house together. Jimmy Hart is apparently scared of going to the bathroom by going by Rowdy Roddy Piper‘s door late at night. In the rooms, we find out that the Legends will be bunking up together. Im marking out big time knowing that this is going to be a killer series for WWE. So, as everyone is chillin in the house getting comfortable, all of a sudden, this beautiful blonde woman named Ashley comes in & pretty much just stands there, looks pretty & tells the guys to go and deliver bunt cakes to the neighbors. Ashley Roberts, formerly of the Pussycat Dolls, was the special “enforcer” on WWE Legends House, telling the guys to deliver cakes to the local neighbors. Bunt cake? No 7up Cake? German Chocolate Cake, Pineapple Upside Down cake? Id be all kinds of offended. You are former WWE wrestlers, come stronger than that. Even some Krispy Kreme donuts would suffice. Anywho, the guys go out & deliver food. Roddy Piper is having flashbacks of Wrestlemania 1 by having a match with a basic blender & clearly the blender wins in a squash. Piper challenges the blender to come on Piper’s Pit & cut a promo for a return match in the future. (Ok, the last part didn’t happen, but it would have been freaking hilarious). After the guys deliver the food, they get a visit from of all people…………….Gary Busey. They do meditation outside & Busey challenges them to bury the old rivalries & bitter feelings from the past. Tony Atlas decides he wants to have a deep connection with Busey so he talks about how he helps kids. Hacksaw Duggan is all about his own kids. Time for a classic 1986 showdown every one. Tony Atlas as Saba Simba way back in the day. For those who don’t know, Pat Patterson is gay & was one of the first openly gay professional wrestlers to ever be in the WWE, which makes that line that much funnier. While Patterson is making the cabbage rolls, the guys go out & play tennis. Because I actually want people to continue reading this blog, I will not show Howard Finkel playing tennis………….or…….maybe I will. 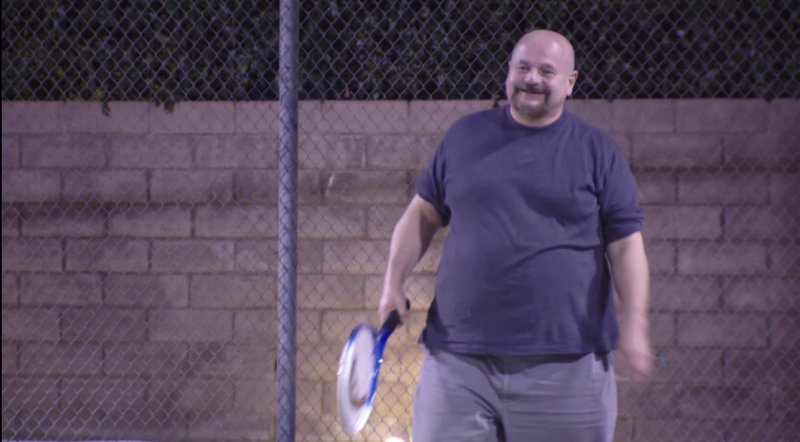 Howard Finkel, WWE Hall of Famer, playing tennis. However, he might have put away a couple of sandwiches in his day. Roddy Piper Shows That He Has Real Issues After His WWE Career. After all of the fun & games of the show, things get very serious when the guys are drinking & Piper, who is a recovering alcoholic, feels like he might be going back into the dark place of possibly drinking again. This is a situation that we can’t make fun of. Piper has been strong for years kicking that habit that many of the older (& probably some new) WWE performers have had where they try to get off pain killers, alcohol & other deterrents to their health, which they may have been taking during their heyday when that kind of lifestyle was normal. Piper goes out for a walk to get away from it all, & more power to him for doing so. Walking away from a disease like alcoholism is something that is a daily struggle & he made the right choice by not being around the problem. So far, I think Legends House has been a hit for the WWE Network, its a strong set up to wrestling night in America, which is turning into Thursday nights for the company with Legends House, WWE NXT & then either WWE Superstars or a special presentation show at 10 p.m, which this week is the WWE Best of the Hall of Fame. This looks like the weirdest show ever! It really is! There are so many wild up & downs with it. Even though its only at episode 3 right now, its shaping up to be one of the funniest shows on TV this summer! Also, thank you so much for reading the article & following the blog. Greatly & humbly appreciate it!